The basic purpose of a Toy Hauler is to be able to carry transportation with you-the back door drops open into a ramp that allows you to drive an ATV, Golf Cart, motorcycle, or even a very small car up into the trailer. I don’t have transportation to haul, yet. So, one of the coolest things I do with my Toy Hauler is drop the back door down part way, and prop it up with “legs”, creating a walk out deck that can also become an enclosed porch. 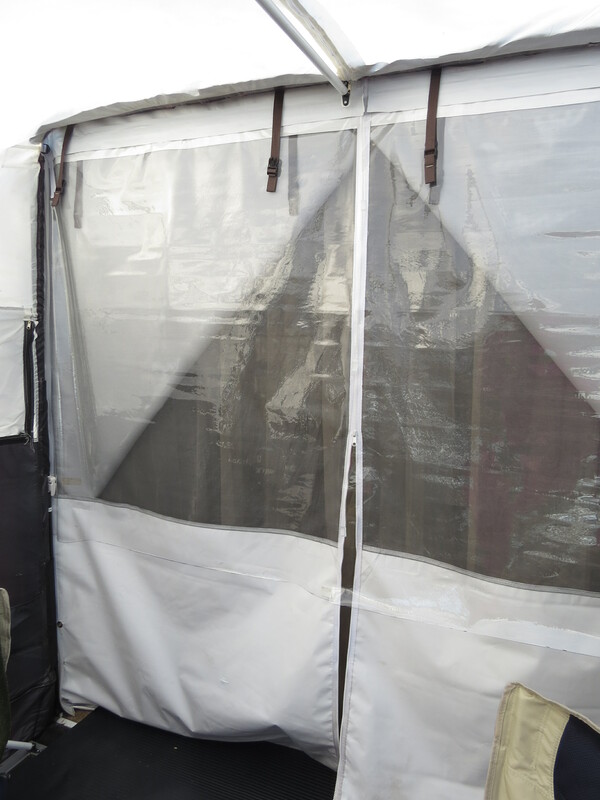 A heavy white vinyl panel wall with screen on the top half that zippers open and closed in the center, closes off the back of the Toy Hauler from the outside, and a tent is attached that stretches out across the “door” that has opened down. On the inside are two white vinyl flaps that can close across the screens. The good news is, the tent provides a whole extra “room”, and the big screen window of the tent provides an amazing view (if you’ve got an amazing view at your disposal, that is). Being able to have that extra space makes a huge difference in long term stays. The bad news is, the tent is thin, not very sturdy, and if it’s chilly out, the cold comes straight in through the vinyl and screen wall that close off the toy hauler from the porch–unless you drop the heavy white vinyl panels down to cover the screens, thereby, closing off all the light from the porch, and giving the inside of the Toy Hauler a feeling of small space again. Well, the other day I decided to do something about it. 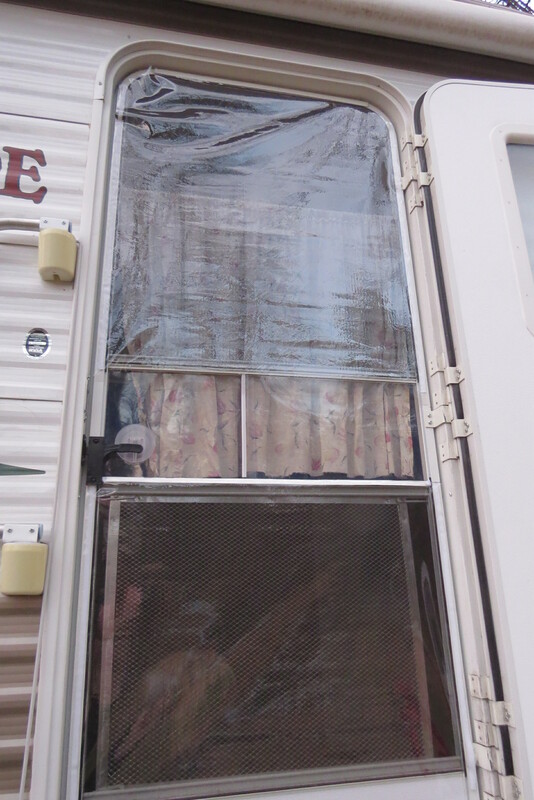 My latest DIY improvement to the Toy Hauler—crafting seasonal windows! Tools for the job? First I measured the screen window part of the heavy white vinyl panels at 4 foot wide, and about 5 foot long, and cut 2 slightly oversized clear vinyl covers for them. I attached them by securing industrial Velcro to the tops of the clear vinyl, and then placing them about 4 inches above the screen area on outside side of the white vinyl panel wall. Then I covered that attachment with two rows of white duct tape, both for cosmetic reasons, and to add strength to the Velcro bond. The clear vinyl covers several inches below the screen, to ensure blocking of any air movement, and reaches beyond the outside edges and slightly over the zipper sides of each of the two sides. 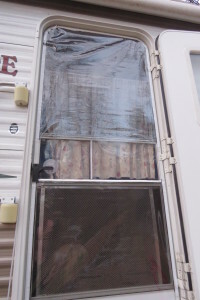 I selected several places along the outside edges of the clear windows to secure to the wall using Velcro, so there is no chance of the clear panels flopping open in wind. As for the center where the windows meet – they overlap just enough in the center to hold them together, but I still reinforced them with several 1” spots of Velcro attachment along the zipper and one side of the very bottom of one panel. They completely block all air flow! If I don’t want to close off the screen with the clear vinyl windows, I can easily roll one or both of the clear panels up and secure them at the top of the white vinyl panels with a ribbon. When total privacy is required, I can just drop the inside short white panels down, covering the screen area from the inside, with or without the clear vinyl windows on the outside. My little DIY project works slick! And more good news—now that I have the clear windows attached to the white vinyl wall, I will be able to bring light into the back of the Toy Hauler even without a tent extending out across the dropped door. The vinyl windows will work just fine being exposed directly to the outside (although I hesitate to test them in a torrential rain storm). If the tent falls apart, I can still enjoy an open “deck” as well. The same situation exists with the door into my Toy Hauler. The main door has just a small, heavily frosted glass window, so when it’s closed there is very little light that can get in. When the door is secured open, what’s left is a screen door, which is just that…screen….so again, it gets pretty darn cold if you try to secure the main door open and just use the screen door. And Leech Lake in October? Well, it can get chilly, indeed! The fix for this situation? Craft another seasonal window, of course! For this project, no duct tape was needed, just white Velcro and clear vinyl. I was able to cut the 28 ½” wide by 35” long top screen and 28 ½ wide by 24 long bottom screen panel needed in about 10 minutes, and have them attached to the screen door on the top and sides in less than 30 minutes. I cut the Velcro to half its width along all 3 sides of the door and made sure to attach the soft side of the Velcro ON the screen door so stuff doesn’t stick to it. The clear vinyl windows completely block all wind, but give me loads of additional light. Another added benefit is that the clear vinyl will prevent the no-see-ums from getting inside (yes, those pesky biters can squeeze through normal window screens!) My intention is to leave the clear vinyl on my screen door “most” of the time unless I’m camped somewhere where it is warm enough to not worry about it. And there you have it. Another simple DIY solution is achieved! Here’s to lighting things up with my windows to the world! This sounds like an excellent idea! It does indeed get cold in Minnesota, and that makes having some space to move around in even more important. If it was just me, it wouldn’t be all that big of a deal, but with the 4-legged kids, yes it makes a huge difference! Very crafty! And how wonderful you got to create perfect-for-you solutions. Yay to lots more light. Your projects look fantastic. It always amazes me how people manage to make things that align perfectly. I usually start with a lot of enthusiasm, but I lose my patience after about 5 minutes. LOL! I’m always trying to do something or other…. Yes, Debbie, that’s right! You cruise too! It made all the difference in the world for me with temps in the 30’s and 40’s. I can already tell it will be awesome in Florida–can’t wait! Just make sure to get the heavier clear vinyl. If it’s too thin it won’t hold up. This makes me wish my husband and I were closer to our RV life! 🙂 I believe I was a gypsy in another life. Or, maybe it is this one after all….